Designed with lightweight aluminum and durable stainless steel, this unit combines maneuverability with ruggedness. At a length of 8.3” and a weight of 12.7 ounces, the Alpha 45 provides the shooter assurance that the silencer will be reliable throughout its use. Moreover, a unique “canine V-shaped” monocore baffle and hard-coat anodized and Teflon finish only add to the suppressor’s toughness. 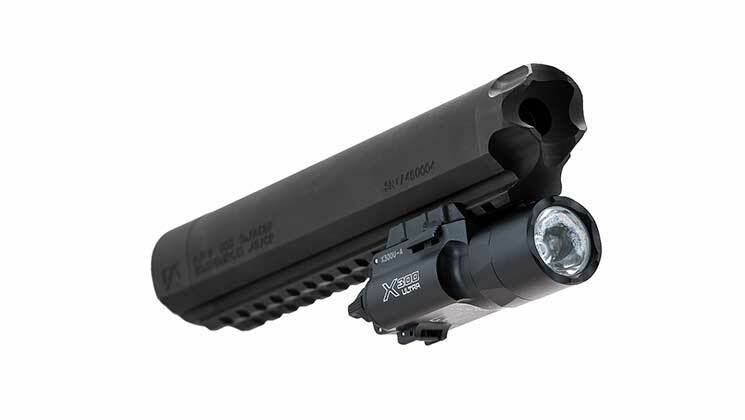 With the many available accessories (e.g., optical sights, flashlights/lasers) that are attachable to the rail, the Alpha 45’s versatility is off-the-charts. Speaking of the rail, its quick-set indexing gives the shooter a plethora of mounting components and sight picture options while in the field. Now we know what you are thinking... won't my suppressor melt the accessory attached to the rail? While we won't deny the possibility of melting plastic accessories, the rail itself actually acts as a heat sync. Vastly increasing the surface area of the tube means that the Alpha Dog heats up more slowly and dissapates that heat more efficiently than a "standard" cylindrical tube.